The future of Japan's manned space activities hinges on safe, reliable technologies for re-entry and return procedures. With that need clearly in mind, researchers are working hard on an atmospheric re-entry capsule with lift. 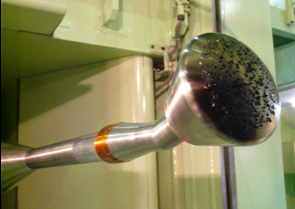 To develop a capsule-shaped atmospheric re-entry vehicle, engineers need to predict and evaluate the vehicle's aerodynamic characteristics in the various conditions of the re-entry process. This study aims to support atmospheric re-entry capsule research by ensuring the necessary testing capabilities for predicting the wide array of aerodynamic characteristics that the phases of re-entry bring about. 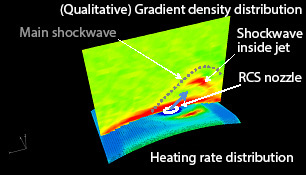 The first step is to create ways of predicting the aerodynamic interference characteristics created by RCS (reaction control systems) in re-entry capsules (Figure 1), establish support interference correction technologies for use in supersonic ranges, propose and verify Reynolds (Re) number correction methods for use in transonic and subsonic ranges (Figure 2), and determine the aerodynamic interference generated by model supports in supersonic ranges. The second step is to assess and improve the aerodynamic dynamic instability that re-entry capsules often experience at transonic speeds. Even with a statically stable configuration, there are cases in which oscillation grows infinitely and results in the capsule turning upside-down. This is a phenomenon called dynamic instability. Consequently, although it is desirable to deploy the recovery parachute at an early stage, deployment is difficult in supersonic speed. In the case of a lifting capsule with an offset center of gravity from its symmetric axis, flight control is possible even in transonic speed. Therefore, it is necessary to estimate dynamic stability characteristics at transonic speed. 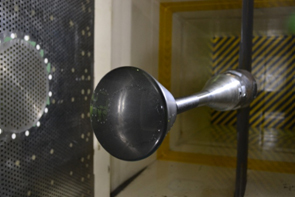 To estimate dynamic stability of the capsule, wind tunnel tests, ballistic range-based free flight tests, and unsteady CFD are attempted and their effective combination is reviewed.